Saturday, August 10th, 2019, 6:00 am. Weather Dates are Sunday, August 10th, Saturday, August 17th, and Sunday, August 18th. Block Challenge 18-mile Open Ocean Paddle, Saturday, August 10th, 2019. Each paddler must raise or contribute a minimum of $1500 to participate. Students must raise or contribute a minimum of $750 to participate. This paddle will begin at 6:00 am and will take approximately six hours. There are spots for seven two-person relay teams. Both members must donate or raise a minimum of $1500 ($3000 total per team.) Team members determine how far and how often each member will paddle before handing off to their teammate. Support will be provided for the handoff. Saturday, August 10th, 2019. All participants will receive periodic e-mail updates on event status. Montauk, NY to Block Island, RI. A distance of approximately 18 miles, this is an open ocean crossing. 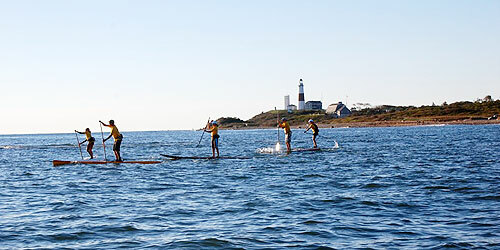 The start of the paddle begins on the north side of the Montauk Lighthouse and ends at the Narragansett Inn on Block Island. Participants entering this event are required to stay true to the theme and intention of the paddle, which is to raise or contribute a minimum of $1,500 per person. Students are required to raise or contribute a minimum of $750 per person. No paddler will be allowed to paddle if he/she has not raised the minimum requirement. All paddlers are strongly encouraged to make all efforts to raise over and beyond the minimum. If unable to paddle for any reason, there will be no refunds for donations received. All competitors are encouraged to make use of our fund-raising materials. Participants will have access to our web site to track donations. To create a fundraising page, click here. It is suggested that participants have completed at least a 10-mile paddle within the last 12 months. Kayaks, paddleboards, sculls, and outrigger canoes. All paddlers in kayaks and outrigger canoes must wear a life preserver, and all paddlers on paddle boards must wear a life preserver and have a leash attached to their paddle board. NO EXCEPTIONS! Email paddle@p4h.org for more information. August 9th. 2019. Please do not forget to sign and include waivers and release. Participants under 18 yrs old must submit a signed parental statement. All athletes and support boat captains must attend the mandatory pre-event briefing on Friday, August 9th, 2019 at 5:00 pm. We will distribute race packets to all competitors and give our final paddle instructions and updates. Please bring a change of warm comfortable clothes in a dry bag marked clearly with your name to the pre-event briefing. These bags will be placed on the morning ferry to Block Island and be available to you at the completion of the event. All paddlers must wear the official Paddlers for Humanity jersey during the entire event. All participants must carry adequate water, food and beverages needed to complete a 6-hour paddle. On the north side of the Montauk Lighthouse, 2 orange buoys will mark the start. In the new harbor at Block Island, orange buoys will guide you to the finish. For safety reasons, a participant must stop while getting supplies from a support boat. Any paddler more than 200 yards behind the group will be towed forward to join the others to ensure the safety of all the paddlers. There will be no exceptions to this rule. Participants must stop and give assistance to any person in danger while waiting for assistance. You must respect the environment, the ocean, the beach, other competitors, and the volunteers. Entry fee includes race day boat support, event Lycra®, event tee, post-event party and ferry ride back to Montauk after party. Click here to read the Terms & Conditions for participation. By mid-July, plan a minimum of 3 to 4 paddles that are at least 3 to 4 hours long. These paddles should be well supported with food, drink, and sun protection. 1 to 2 yoga classes a week will keep your body flexible and strong. It is essential to paddle in rough conditions whenever possible. Don't let bad weather stop you from experiencing an invigorating paddle!